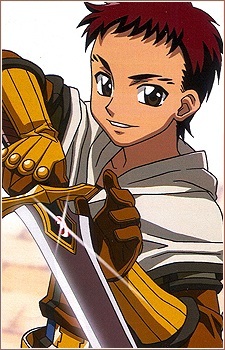 The main protagonist, Roan is a swordsman whose main goal in the anime is to gain power to protect his childhood friend, Yufa. At one point, he believes he has failed in this and goes off alone to get stronger. After a fateful encounter in Byalan, Roan returns to the group as a Crusader, successfully rescuing Yufa. However, as the story progresses, Roan begins to lose sight of his duty. He later realizes his wrong after some advice from the Legendary Witch in Payon and Comodo. However, it was too late as Roan made it only on time to see Yufa leave with her brother. Afterwards, the group heads towards Glast Heim to save Yufa and to stop Dark Lord. On the way, they are confronted by a possessed Yufa who sends a torrent of undead monsters at her friends. After their victory, she teleports them directly to Glast Heim. With the help and sacrifice of the rest of the party, Roan manages to locate Yufa. However, he finds her to be unable to truly hear his words. Tricking Roan, Yufa kisses him and slips the cursed ruby into his mouth, which he then swallows. Upon realizing this, the cursed ruby begins to kill Roan. Unable to draw his sword, Roan allows Yufa to stab him with a cursed blade. Eventually, Yufa breaks free from her mental bonds and frees Roan from the curse she had set on him with a kiss of true love. Then, he, Yufa and the rest of the surviving group reunite to defeat Dark Lord. In the end, Roan and Yufa were each seen wearing a ring, implying that they are now married.